An apprenticeship with a Yoruba sculptor in Nigeria transformed his life and led him to interdisciplinary studies at Columbia University in African art history and culture where he earned two Masters’ degrees and a PhD. Since 1991 he has been the Evjue-Bascom Professor of Art History and Afro-American Studies at UW-Madison. 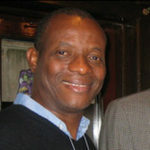 His published work includes several books, edited volumes, exhibition catalogues, and many articles on African/African Diaspora arts: Introspectives: Contemporary Art by Americans and Brazilians of African Descent; Yoruba: Nine Centuries of African Art and Thought; Beads, Body, and Soul: Art and Light in the Yoruba Universe; and Mami Wata: Arts for Water Spirits in Africa and its Diasporas. His current work, called Sensiotics, considers the crucial role of the senses in shaping body-minds, arts, cultures, and histories that inspired the current multi-sensorial, interactive exhibition Whirling Return of the Ancestors. 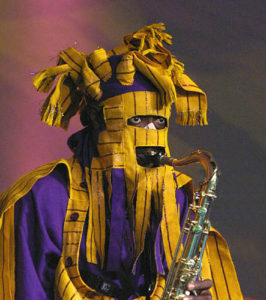 Long before Egungun masquerades are allowed in the public arena, the entire ensemble including the bundled cluster of whips, atori are first consecrated in a communal event involving the chanting of the lineage panegyrics, oriki, invocation of prayers, songs and dance as well as votive food offerings to the spirit of the departed. The ritual food offerings range from a few cotyledons of red and white kolanuts, obi abata, bitter kola, orogbo, alligator pepper, ataare, mashed corn portage or pap, eko as well as bean pudding, moin moin in addition to the sprinkling of a few drops of hard liquor, ogogoro and palm oil, epo pupa to literally wet the palate of the departed ancestors—only in this way will the spirit descend. I intend to explore the spiritual and ritual implications of these objects in Egungun celebrations. Bolaji Campbell is Professor of African and African Diaspora Art in the Department of History of Art and Visual Culture at RISD. Campbell holds a PhD in art history from the University of Wisconsin, Madison and MFA and BA degrees in fine arts from the Obafemi Awolowo University (formerly University of Ife) in Ile-Ife, Nigeria. 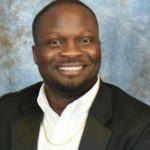 He has previously taught at Obafemi Awolowo University, the University of Tennessee at Knoxville, the University of Wisconsin, Madison and the College of Charleston in South Carolina. He has received numerous honors and awards, including the Sylvia and Pamela Coleman Fellowship, Metropolitan Museum of Art, New York; The Richard A. Horovitz Professional Development Fund Fellowship, Institute of International Education; and a Postdoctoral Fellowship, Avery Research Center for African American History and Culture. Campbell is listed in Marquis Who’s Who in America, Nigerian Artists: A Who’s Who and Bibliography (Smithsonian Institution), L’Art Africain Contemporain, Guidebook to Contemporary African Art (Paris). He has published numerous essays in learned journals and as chapters in books. His most recent work is a book entitled Painting for the Gods: Art and Aesthetics of Yoruba Religious Murals (Africa World Press, 2008). The paper considers an experimental methodology in which we present Ifa with the question of the relevance and role of European aesthetics for exploring the art of Africa. Ifa, regarded as Akéréfinúsogbón Ẹlérìíìpín, is understood as having an answer to all questions. The paper reflects on the possibilities and challenges of using Ifa divination as a tool for art historical analysis. It also investigates the processes of Ifa consultation as a means of deploying the multi-sensorial dimensions of artistic experience, which Henry Drewal has aptly described as “sensiotic.” With the analysis of specified sessions of consultations of Ifa witnessed by the author, the paper engages matters of language in African art historical writing raised by Rowland Abiodun in his latest book, and the complications arising from the triple consciousness of Africans looking at African art from the perspective of colonizing artistic activities. 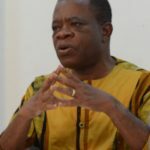 Moyo Okediji is professor of African art and art history at the University of Texas, Austin, where he served as the director of the Center for Art of Africa and its Diasporas. His latest book is titled Western Frontiers of African Art. He studied with Henry Drewal at the University of Wisconsin, Madison, where he obtained a doctorate in 1995. He has taught at various universities in the United States and Nigeria, and for a decade he was curator of African and Oceanic arts at the Denver Art Museum. He produces mobile Egungun installations with contemporary themes and has shown his work at several museums including the New Museum of Contemporary Art, Smithsonian Museum for African Art and Denver Art Museum. He is currently working on the 256 icons of Ifa, the subject of his new series of paintings and installations. He is also writing a book on these 256 icons for which he has devised mathematical computational patterns. This talk responds to the profound silence surrounding the memory of women’s prison experiences within South Africa’s post-apartheid public culture. It considers the relationship between trauma, memory, and representation through an analysis of “sites of suffering” for women activists during and immediately after the liberation struggle, focusing primarily on the Johannesburg Women’s Jail, where female political prisoners were held. Formerly an apartheid-era prison, the Women’s Jail is now a museum located on Constitution Hill in Johannesburg. It is a space that allows for the expression of women’s activism and agency by centering the voices of former prisoners as they tell their own stories of suffering and survival. They tell about the prison as a site of female companionship, resistance, and as a space that allowed for intellectual exchange among women. My analysis of this site addresses the political power of physical spaces, the ways that women’s lives were spatialized under apartheid, and how reinvention allows for an exploration of feminist concerns in these same spaces. I also consider the ways in which emotion influences, and is formative to, the process of research, writing, and work having to do with trauma and suffering. 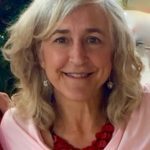 Kim Miller is Associate Professor at Wheaton College in Norton, MA, where she holds the Jane Oxford Keiter Professorship of women’s and gender studies and art history. She is a research associate at the Visual Identities in Art and Design research center, University of Johannesburg, South Africa. Miller’s scholarship, which examines the relationship between visual culture, gender, and power in African arts, includes her forthcoming book, How did they Dare? Women’s Activism and the Work of Memory in South African Commemorative Art. Her first book, Bronze Warriors and Plastic Presidents: Public Art in South Africa, 1999 – 2015, is co-edited with Brenda Schmahmann. 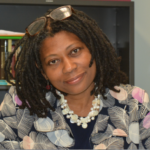 Dr. Shannen Hill is President of the Arts Council of the African Studies Association and a Research Associate with the National Museum of African Art, a Smithsonan Institution. A curator, professor, and scholar of twenty years, her first book, Biko’s Ghost: The Iconography of Black Consciousness (U. of Minnesota Press, 2015) was supported by a J. Paul Getty Post-Doctoral Fellowship. The Smithsonian Institution supported the writing of her second book, tentatively called Visual Histories of Mining in the Making of South Africa, in the form of a Senior Fellowship. Her publications include studies of African American art, central, and southern African art, and her exhibitions of historical African art are drawn from the entire continent. This includes an exhibition now underway for the Agnes Etherington Art Centre at Queen’s University called The Art of African Ivory, which opens April 28 in Kingston, Ontario. Who is fitting to be remembered and memorialized in the afterlife? In other words, who becomes a revered egun (ancestor)? Using Yoruba concepts of who becomes a revered ancestor, the paper explores the relationship between memory and memorializing, memory and representation, and the spectatorial gaze in the attempt to capture history. It will explore different historical monuments like the statue of Zumbi in Rio, Harriet Tubman and Frederick Douglass in Harlem, the MOPANAH in Haiti – the site of the entombment of Henri Christophe and Jean Jacques Dessalines, and intersect with the discussion on confederate memorials in this new iteration of Black Lives Matter. The analysis will center on how neither image nor representation is neutral or value free, and the spectator of histories of trauma and agency are caught between the originating event and the possibility of capturing it, feeling it, identifying or dis-identifying with it. In effect, transforming the gaze into a bodily, sensorial epistemology that allows the viewers to engage with the past and its present effects. Cheryl Sterling is an Associate Professor of English and Director of the Black Studies Program at The City College (CUNY). Her award winning book, African Roots, Brazilian Rites: Cultural and National Identity (Palgrave MacMillan 2012), explores how Afro-Brazilians reconstruct the Yoruba matrix within Candomblé to create contemporary literary and performance culture. In her current book project, she creates Aesthetic theory based on Yoruba orisha paradigms to read African and African Diasporic texts and images. During his fifty-year art career, contemporary painter Moyo Ogundipe (1948-2017) frequently employed the Egungun festivals he experienced as a child in southwest Nigeria as a metaphor for the complexity of human experience. I argue that in paintings such as Detonation of Cosmic Seeds, 1995, he did not simply visualize the pageant of colors on display, but rather, he attempted to translate the multi-sensorial experience of the festivals, and simulated the dynamic spectacle of sights, sounds, movements, tastes, smells, and textures. Moreover, using this multisensorial aesthetic, Ogundipe produced an immersive, holistic, bodily experience, which, much like the Egungun festivals that inspired him, serve to enable deeper understanding of the cosmos and our position within it. 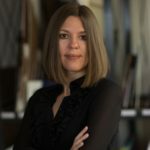 Janine Sytsma, Ph.D., is currently a Visiting Assistant Professor of African and African Diaspora Arts at the University of Arkansas, Fayetteville. Her research in global African arts has been supported by a Fulbright-Hays DDRA Fellowship, a CIC-Smithsonian Institution Fellowship, an Omooba Yemisi Adedoyin Shyllon Foundation Fellowship, and several University of Wisconsin fellowships, and her recent article, “For Learning and Culture: The Early History of Art Training at the University of Ife,” was published in Critical Interventions: Journal of African Art History and Visual Culture. She has also curated several exhibitions in the United States and Nigeria, including, most recently, (Re)visions: New Works by Uchay Joel Chima (2015) and Mythopoeia: Recent Paintings by Moyo Ogundipe (2016). Jews in Fez, Morocco were historically prevented from overtly expressing religious identity in built environment of the mellah or Jewish quarter, but rites moving in and out of their quarter harnessed multiple senses to assert the significant presence of the religious minority. This presentation examines how a number of rituals animated monuments commemorating ancestors during the colonial period (1912-1956). I explore the rise of the hiloula (pl. hillulot) or pilgrimage festival honoring a Jewish saint on the anniversary of his or her death. The revelry associated with the multi-day festivals held in the cemetery contrasted against the subdued prayer services offered in synagogues. 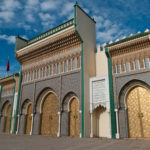 While hillulot were usually associated with rural shrines, the ones in Fez were remarkable because of their presence within a historic urban setting. Hillulot appealed to Jews across the economic spectrum, allowing pilgrims and residents alike to celebrate the plurality of Jewish experiences within the weakening colonial order. Michelle Huntingford Craig teaches at Cuesta College as Lead Faculty in Art History. She is a scholar of African arts and one of her research has focused on expressions of identity in the mellah or Jewish quarter in Fez, Morocco. In the summer of 2017, Kwame Akoto-Bamfo installed “In Memoriam: Portraits of the Middle Passage in Situ” at Cape Coast Castle, a former slave fort in Ghana. Consisting of 1,300 life-sized portrait heads made of local concrete, Akoto-Bamfo placed them on the floor of the castle’s two main dungeons. “Look closely at the faces,” reads a sign at the entrance to the dungeon, “you may see someone who looks like a family member.” But the heads themselves, cloaked in the darkness of the dungeon and huddled together on a floor made of accumulated detritus, dirt, and feces, seemingly disavow visitors’ effort to engage with them. This presentation takes Akoto-Bamfo’s installation as a point of departure to explore how one claims and honors ancestors who leave no descendants: the dead and disappeared taken during the African slave trade. Reading Akoto-Bamfo’s installation alongside the works of Afro-pessimist theorist Saidiya Hartman and novelist Yaa Gyasi, I argue that this installation asks us to claim those we cannot see, whose faces and bodies cannot be felt in the darkness of the dungeon or the pages of the archive. 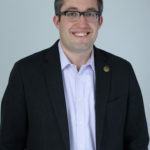 Matthew Francis Rarey is Assistant Professor of Art History at Oberlin College, where his work investigates assemblage and ephemeral aesthetics, visual conceptions of enslavement, and the development of religious arts in the early modern African-Portuguese world. 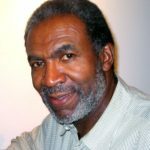 His writing on black Atlantic visual culture has appeared in Theorizing Visual Studies (2012), Romantic Circles Praxis Series (2014) African Heritage and Memories of Slavery in Brazil and the South Atlantic World (2015), and is forthcoming in African Arts. Rarey earned his B.A. from the University of Illinois at Urbana-Champaign, and his M.A. and Ph.D. from the University of Wisconsin-Madison. 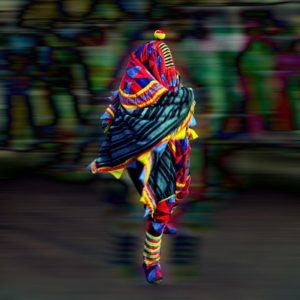 This presentation explores the connection between Egungun masquerade and contemporary art in the African Diaspora. I will highlight the works of three celebrated artists who infuse their artwork with African textiles and design elements. 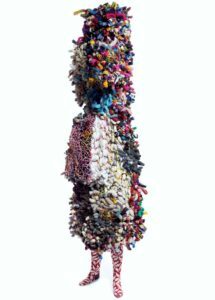 African American conceptual artist Nick Cave creates magnificent colorful recycled sculptural assemblages called “Soundsuits”, wearable works of art that generate sound when performed. Nigerian-British artist Yinka Shonibare, MBE stages elaborately designed vignettes that reinterpret 18th and 19th century cultural history through sculptural installations defined by their costumed life size figures that incorporate colorful European made African print fabric. Ade Adekola, a Nigerian-born and Lagos based conceptual photographer and architect, uses digital reconstructions to capture the contemporary significance of Egungun as dress and display. I will also consider other offshoots of African masquerades in the Diaspora. 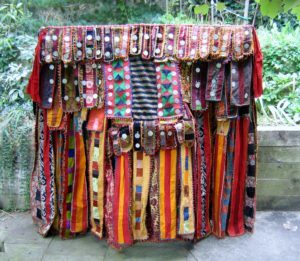 “Pitchy Patchy”, one of the original costumed characters of Jamaican street carnival known as “Jonkonnu”, has layered strips of brightly colored textiles, similar to the structure of Egungun fabric sculptures. 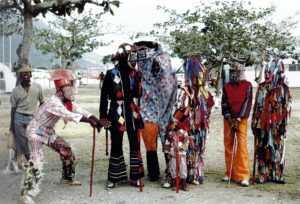 Jonkonnu in Nassau, the Bahamas where performers dressed in shredded sheets of colored paper costumes perform to drumming and singing. This talk contributes to advancing the historic record to reflect the full scope and diversity of the African influence in the visual arts. 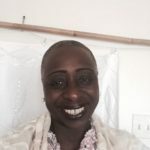 Paulette Young, Ph.D. is a cultural anthropologist and an independent scholar in the visual arts and artistic cultural practices of Africa and the African Diaspora. Her research centers on the historical and contemporary roles of global textiles as an expressive artistic and cultural form. 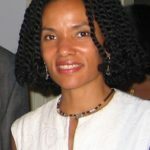 Dr. Young has taught at the Graduate School of Arts and Sciences at Columbia University in the City of New York and she has lectured for various institutions in Africa, Asia, and Europe, and at the Metropolitan Museum of Art, the Museum for African Art, New York, and Parson’s School of Design, Paris. She is based in New York City where she is director of the Young Robertson Gallery, New York. 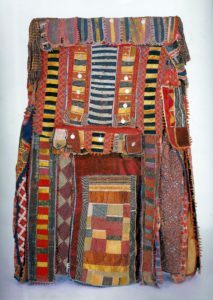 Reflecting on my extensive collecting experience of African textiles in West Africa and Europe starting in 1975, I will discuss the visual power and aesthetic attributes of various Egungun regalia and related African textiles. A survey of relevant early photographic images, some recently discovered, will be included to fill out the historical and artistic connections between African textiles and African American quilts which until recently would not have been considered a major art form. 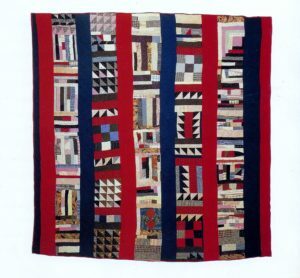 The traditional American master works included here were designed and produced primarily by women from the American South and from black urban areas in the American West. Eric Robertson is internationally known for his extensive knowledge of traditional African art and Africa’s grand textile arts. He has lectured on African art and textiles at institutions including the Barbados Museum and Historical Society, the National Gallery of Jamaica, the Guggenheim Museum, the Museum of Modern Art, New York, the Field Museum (Chicago), the Brooklyn Museum of Art, the Museum for African Art, New York, the Corcoran Gallery of Art (Washington, DC), the Zora Neale Hurston Museum (Eatonville, FL) and numerous universities including Columbia University, Harvard University, Dartmouth College and New York University. He is an advisor to the Young Robertson Gallery, New York. 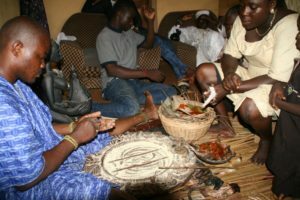 The reverence of Egungun is an integral element of the religious practices and ontological world view of the Lukumi and their progenitors the Yoruba. The Lukumi are known to say “it begins and ends with Egungun”. Through their many intricate systems of divination the Lukumi can communicate with not only their Egungun but all of the forces in the universe. The configurations which appear as a result of the casting of divination instruments are called odu and these odu tell a story known as an apataki. It is through the relating of the apataki and its subsequent interpretation that an individual can understand how to best interact with the forces of the universe; in this case Egungun. This presentation will focus on apataki which explicate and define Egungun reverence in a Lukumi context. L Sauda Smith is an independent researcher. She is an alumna of the African languages and Literature Master’s program. She lived and worked in the British Virgin Islands for 21 years. She has served as the Head of the Humanities, Dean of Arts and Sciences Division and the Vice President of H. Lavity Stoutt College. She has conducted extensive research on Yoruba and Lukumi divination tales, their structure, literary analysis and modern sociological relevance. She is a hurricane Irma survivor now residing in the Mid Hudson Valley. In northeastern Tanzania, honoring ancestors through art and actions lies at the heart of medicine. 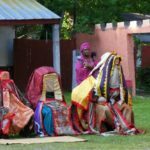 Like other Bantu communities throughout sub-Saharan Africa, many Shambaa people continue to advance an ancient perspective whereby physical, social, and environmental wellness depends on sustained reciprocities between the material realm of people and an ephemeral one teeming with unseen forces. To facilitate exchanges between the realms, healers enlist visual and performing arts. Spirit intermediaries, for example, prompt them to decorate anthropomorphized medicine containers called nkhoba with ritually significant items and body adornments. 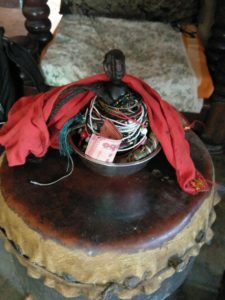 In return, spirits relay the ancestors’ desires, and so disclose both diagnoses and cures. Infused with medicines and spirit forces, nkhoba are body-like entities whose forms, like humans’, are in continual flux. They procreate, comprising “families” that are passed down through generations, serving as vital manifestations of lineal descent. Despite their human-like qualities and close association with somatic processes, nkhoba bear little visual resemblance to people. Inspired by Henry J. Drewal’s inquiries into arts and the senses in Africa, this presentation seeks to understand why. It explores local conceptions of illness and health, and the historical relationship between dance and waist adornments often used to dress nkhoba, discerning a Shambaa sensorium that, unlike Euro-America’s, is not dominated by sight. It proposes that, in Shambaa ancestral arts, figurative imagery privileges movement over mimesis, embodying a local, deep-seated medical belief that to be human and to be healthy is to dance. Marguerite E. Heckscher is a trained theater actress and art historian specializing in Africa’s visual and performing arts and material culture, particularly in northeastern Tanzania. Her research focuses on figurative imagery and object / body relations in traditional healing contexts among Shambaa communities in the West Usambara Mountains. Marguerite is a Ph.D. candidate in the Department of Art History at the University of Wisconsin-Madison, and an American Association of University of Women Dissertation Fellow. Currently, she is writing her dissertation, which is based on Fulbright-Hays-funded research in Tanzania and Germany. This presentation focuses on the significant place of ancestral traditions in understanding the critical space of the sacred-secular continuum in everyday and extraordinary contexts of the lived experience among the Anlo-Ewe. While common notions often associated with the liminal and immanence may allude to this continuum, I innovate and employ the term pneumareisis, which seems to most appropriately capture the meshed—not dual—constitution of the body (physical), mind (consciousness) and extracorporeal states that enable and transcend body-mind-soul existentialities. Drawing on specific examples of practices and their philosophical-phenomenological foundations, this paper clarifies and locates the Anlo-Ewe ancestor (and ancestral traditions) in this mesh. The notion of pneumareisis provides a more plausible orientation and extended contexts in which liminality, immance. and copresence are refreshed continually to enrich the everyday unified world of ancestors, including the essential kodzogbe. The exploration of this mesh the kinds of attitude, mental, and psychic states that are indispensable in inhabiting and thus projecting more accurately the seen and scene-centered (megbe/nukpɔkpɔ) worlds inhabited and shared discursively by my ancestors. Several corporeal, mental, gestural, and ritual-ceremonial traditions which illuminate the shared world of ancestors among the Anlo-Ewe are considered, including those from my immediate, personal environments. Professor Daniel Kodzo Avorgbedor (PhD, IU–Bloomington, 1986) is currently on a post-retirement teaching and research contract at the Institute of African Studies and in the School of Performing Arts, University of Ghana, Legon. Major research and teaching areas include performance theories, African Diaspora studies, cross-cultural aesthetics, and urban ethnomusicology with research focus on rural-urban dynamics in reconstructing Ewe sociocultural and musical identities. Professor Avorgbedor served as coordinator of the Ethnomusicology program at The Ohio State University, Columbus and held a joint appointment in the Department of African American and African Studies, 1995-2010. Major grants received include Wenner-Gren, H.F. Guggenheim, and NEH (team) awards. 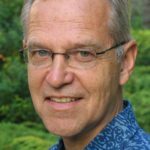 In addition to frequent international speaking engagements, Dr. Avorgbedor has published essays in several journals and entries in encyclopedias such as Oxford Dictionary of Music and Oxford Bibliographies Online, Sage Encyclopedia of Ethnomusicology (in press), Garland Encyclopedia of World Music, (vol. 5, 1998) Encyclopedia of Shamanism,(vol. 1, 2004), and African Folklore: An Encyclopedia. (2004). He edited The Interrelatedness of Music, Religion, and Ritual in African Performance Practice (2003), and served as guest-editor of the special issue of World of Music on Cross-Cultural Aesthetics (2003). He was visiting scholar at Humboldt University, Berlin (2009) and at Gutenberg University, Mainz (2012) and a contributor to EVIA Digital Archive Project (http:/eviada.org). I mirror Mami Wata, the hybrid female water spirit of African origin; she flows and shows across the Diaspora. Why’s it only now that I happen upon her? Is it because she’s archetypally feminine and I consider myself not? But, is this not a powerful reason as to why I should reflect her, tango with her, mimic her or make a humble confession concerning my denial? Maybe there is still time for MW to rise within me? I hear the ancestors reminding me that fixity is unbecoming to the Creator. Perhaps my iteration could be a truer mirror, a reversal of sorts : Ataw Imam. Yes, this resonates with my soul! Or perhaps I could explore another facing: Wawi Mafa. Now that sounds like water, ‘a gentle tide washing in and away from the shore’. So, despite my late arrival at Mami Wata’s place, I’m sure that I’ll now encounter her with increased frequency. I don’t know about you, but I’ve found life to be like that: once you know you cannot un-know. I sense there’s a proverb in there, somewhere. And without the blinkers, the filters and my load of preconditions the dynamism of MW’s ageless rhythms and wisdom are once again in motion. 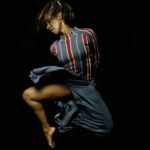 Dr. S. Ama Wray, Associate Professor of Dance at the University of California, Irvine, describes herself as a ‘Neo-African Performance Architect.’ In 2018 she was recognized by the Comparative & International Education Society, receiving one of four African Diaspora Emerging Scholar Awards. Receiving her PhD from the University of Surrey; her dissertation, “Towards Embodiology: Modelling Relations between West African Performance Practices, Contemporary Dance Improvisation and Seselelame” brought forth Embodiology® – a six-tier transdisciplinary methodology that results in practitioners being able to create on-the-spot, with or for others, with mindful dexterity. A new essay on this subject titled “Embodiology®: A Neo-African Improvisation-as-Performance Practice, distinguished by Dynamic Rhythm,” is forthcoming in The Oxford Handbook of Improvisation in Dance, edited by Vida Midgelow. Further dissemination of the praxis, demonstrating how movement inspires the mind, is evident in her TEDx Talk, “Bodily Steps to Innovation.” Before academia, in the UK, she was a member of both London Contemporary Dance Theatre and Rambert Dance Company, and is also widely known for her role as performer and custodian of Harmonica Breakdown (1938), choreographed by Jane Dudley. She also founded JazzXchange Music and Dance Company, now known simply as JazzXchange. Later, her improvisation praxis also reached into digital domains, when her National Endowment for Science Technology and the Arts Fellowship produced the award- winning Texterritory, in collaboration with Fleeta Siegel. Additionally, she has directed African-centered physical theater plays by activist playwright/performer Mojisola Adebayo. Muhammad Ali and Me and Moj of the Antarctic toured both the UK and Southern Africa. Oyotunji African Village is the first intentional community based on the culture of the Yoruba and Dahomey tribes of West Africa; founded, (1970) in the Americas. Now in 2016, after over 45 years of sustaining the only Kingdom based on traditional Yoruba sociology and values, OAV brings to the Low-country and greater global community the depth of culture, beautiful art, grandeur of customs and resilient history of the New World Yoruba. The Kingdom of Oyotunji African Village’s core business is to serve in the elevation of humanity’s understanding and appreciation of the genius, highly technical, social and Royal hierarchy of African people. The institution of OAV serves as a real-time reminder of the sociology and African world view contribution made to society by African ancestors of antiquity. 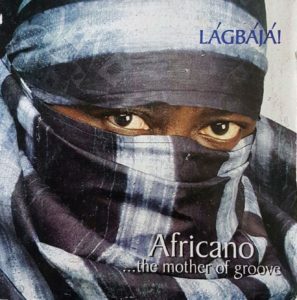 Lágbájá: Reinventing the Ancestral Return and Sensiotics in Bisade Ologunde’s Afropolitan Music. The presentation will examine the transmutation of the Egungun ancestral return into a different aesthetic of artistic persona and music in Bisade Ologunde (a.ka Lágbájá)’s oeuvre. I will focus on Ologunde’s recreation of the Egúngún paraphernalia and its sensiotics to a portable artistic and aesthetic mode for a more contemporary and diverse audience. I will examine Ologunde’s ‘drum affirmations’, performative aura and the spectacle of ancestral invocation in the material, artistic and the social imaginary of the Egungun ensemble. The presentation will further prod beyond the immediate, live, multisensory, out-of-body-experience in Ologunde’s ancestral impersonation and performance to examine where he draws the line between the sacred and the profane in his music production. Oladipupo Oyeleye is a P.h.D candidate in the Department of English, University of Wisconsin-Madison. He holds Master of Arts degrees in English and African American Studies from the University of Ibadan and the University of Wisconsin-Madison respectively. 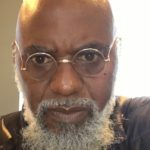 His research interests are in Black Diasporic Anglophone Literature; African Digital Rhetoric, Visual Art, and Music; African American studies and Foreign Language Pedagogy.